One of the tasks of small and middle-sized communes is to prevent from depreciating. The purchasing power flows-off more and more to the large cities and the centrals on the “green grass”. The EcoSystem for city cards of SmartLoyalty is just to help to stop this process. Often the budget of the communes and promotion communities is strong delimited – so we have develeoped for you an affordable “Mini-Payback-Card-System” that can be used efficiently also in smaller districts. Prevent from Purchasing Power Flow-offs. How the City Card works. Just teamwork: you define the look of your city cards and the performances of the city card system. And we take your individual requirements and your marketing concept into practice. 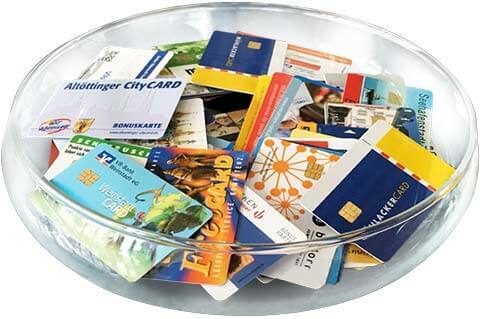 You get an inexpensive and usable city card system which is ready for action immediately. With smart chipcards and intelligent terminals: with an internal encoding the terminals of the companies taking part in the city card system can be defined. On the chipcards the customers collect bonus points. With this it´s possible that the common city cards can be handed out by different establishments and is accepted one another. Over the SmartLoyalty software the given and taken points per company are related and cleared. controlled by yourself: your system – your rules! The software of our City Card System provides useful tools to support your marketing activities.